TL;DR: In this post, we are going to integrate a React application with Auth0 Rules. Auth0 Rules allow for easier application of restrictions or allowances to projects. When using Auth0’s product, it is nice to know that there are rules made available to make life easier as a developer. Let’s see how a couple of these rules work. We can find the GitHub repo here for the project we will be adding rules to. What Is An Auth0 Rule? How does an Auth0 Rule help us in our authentication process? Let’s say we have an application and we want to make sure that a specific user has certain roles, like an admin role for example. Or we want to add in multi-factor authentication with Duo Security or Auth0 Guardian. 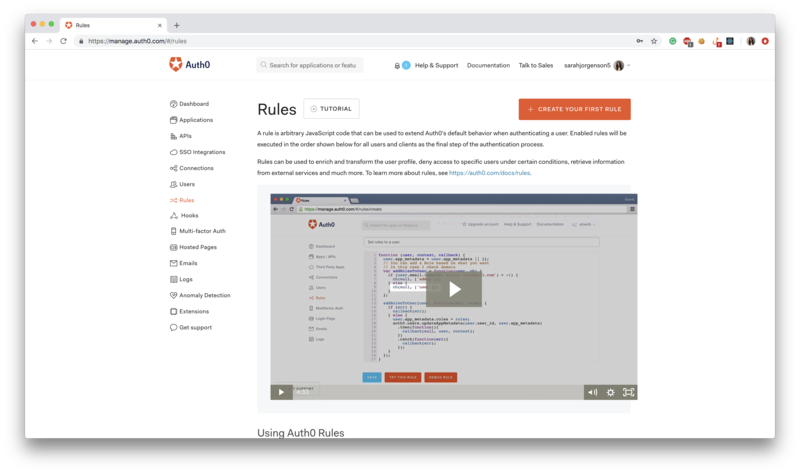 Rather than writing out the code for all of that, Auth0 provides Rules that can be added to projects and will take care of all the heavy-lifting for authentication restrictions or requirements. 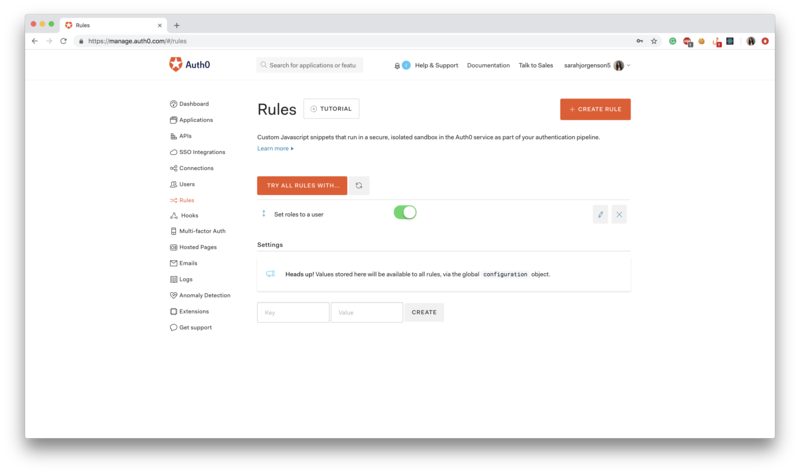 We can find and manage Rules in our Auth0 Dashboard. There, we will be able to configure one or more rules, depending on which ones we find necessary for our project. However, before diving into Auth0 Rules, we will need to get a React app up and running. In this post, we will use the React application we created in the React Tutorial with Popup Authentication. In this React application, we initially have a view of "TV Shows" and a "Log In" button. Once the user clicks that, a pop-up modal will appear. The user will be able to authenticate and the app will take them to a view that has both "TV Shows" and "Movies" available. The "Movies" view is a protected route so the user can only view this list of information only if they are authenticated properly. After that, we can issue the following command to move the terminal to our React project. Note: All these files are marked as ignored on Git, so we will need to create them. Let's go to auth0.com and either login or signup. In the Dashboard, we will click on the "New Application" button, give the application a name, choose "Single Page App" and click "Create". Once that is done, click on the "Settings" tab and there we will find all the information we need to put in this file. The audience property will be what we do next. So for now, we will leave it blank. In the properties, redirect and logoutUrl, we will want to put those values within the "Settings" for our application on our Dashboard. The redirect will go in the section that says "Allowed Callback URLs" and the logoutUrl value will go in the "Allowed Logout URLs" section. Be sure to hit "Save Changes" at the bottom when done! Still in our Auth0 Dashboard, let's click on "APIs" on the left-hand menu and then click "+ Create API". We will give our API a name and an identifier. The identifier could be something like https://movies-and-tv-shows/. Once the name and identifier are filled in, hit "Create". Within the "Settings" tab, we will be able to find our API identifier that we just created. Now we can fill in this file with the correct information. Note: We will need to update the audience field in the src/auth/config.js file as well. clientID: "your Auth0 client id"
After running this command, we will be able to see our app running on the http://localhost:3000/ URL. There, we will see "TV Shows" views and the "Log In" button. If we click on this button, a modal will appear so we can authenticate ourselves. After the authentication process, Auth0 will redirect us back to our app where we will see both the "TV Shows" and "Movies" views. If we head back to our Auth0 Dashboard, we can go to the "Rules" section. We will see the main page of the Auth0 rules. Once in there, click on "+ CREATE YOUR FIRST RULE"
Now we are ready to pick which rule we will be adding today! Let’s say we want our email address to be considered an "admin". Auth0 has a rule that can help us out with that! If we click on the button that says "Set roles to a user" which is under the "Access Control" section, it will then take us to a page where we can see the code for the rule. Note: If needed, we can always use ctrl+F (or cmd+F) to find keywords. Note: Replace the value passed to endsWith with the desired email address. Any email that "endsWith" the value entered will be given the value of "admin". If you put "jorgenson@auth0.com" that would result in "sarah.jorgenson@auth0.com" and "jeff.jorgenson@auth0.com" having the "admin" value. Scroll down and we will click on the Save button at the bottom. That’s it! Now if we go to our Rules dashboard, we will see at the bottom of the screen that we now have that rule added in! "You can set roles to a user by implementing the Auth0 Rule 'Set Roles to a User'"
That console.log will return our user’s information once they have logged in. Once that is saved, let’s head on over to our app in our browser. If we open up our dev tools by right-clicking in our app and clicking on "Inspect" we will have those open. Once those are open, click on the "Console" tab at the top of that. While we are logging in, we will watch that! Click on "Log In" and the popup will appear, log in by whichever means and then the popup will disappear. Once that disappears, there should be a line in our "Console". Click on the drop-down arrow and all the user’s information will be there! We will see that, in fact, our user does have the "admin" role! Now, this only works if we used the email address to log in that we put as the "admin" in the rule. If we drop down that line, we’ll see a little more information on that admin role. The more information being the added role of admin." If we were to go back to that rule and change it to a different email address, then that email address we just used would change back to "user" status. Now we know that rule is working! If we wanted the origin country and the timezone of the person logging in, there is an Auth0 rule for that as well! If we click on the "+ Create Rule" button in the "Rules" part of the Auth0 Dashboard, we can find the rule titled: "Add country to the user profile" under the section "Enrich Profile" of the Rules dashboard. Once we click on that rule, we can see all the code that would make that rule work correctly. Click on "Save" and we are good to go! Again, let’s make sure it works! If we kept the console.log in our login function from src/auth/service.js then we are going to be good to go. We are going to head on over to the app in our browser and refresh the page. We are going to keep the "Console" tab open in our dev tools so that we can see the new console.log show up. Once we log in and are authorized correctly, let’s open up our user information in the "Console". We now see that it’s working and it’s attaching my country to my user profile. Great! Another rule has been added to our project! We have so many options!! Let’s click on the MFA option that is titled "Multi-factor with Google Authenticator". Once we click "Save" at the bottom, we should be all ready to test it out! We would need the Google Authenticator app on our phone in order to move on and scan the barcode, but we do see that it is working! If we were to scan that with the app on our phone, we would then get a six-digit verification code that we would put at the bottom of the popup. Once we continue on, the popup will disappear, we will be authentication with MFA and we will see the protected view of "TV Shows" and "Movies". 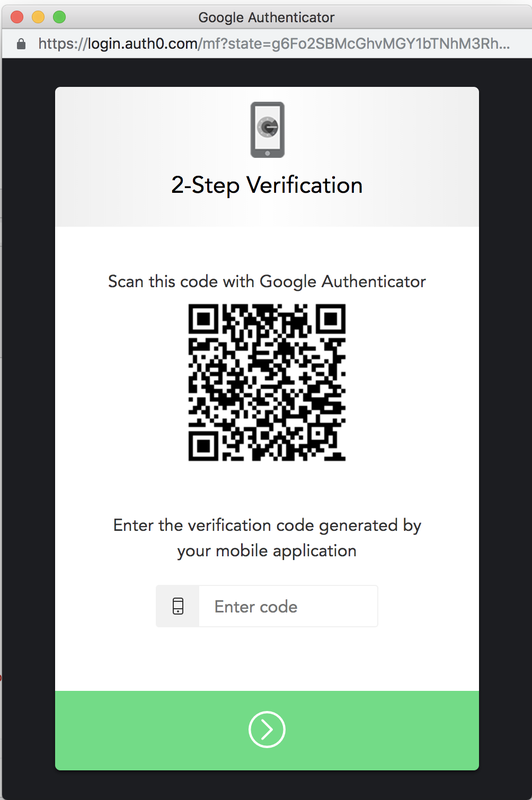 Note: If, for whatever reason, we don't want to use the Google Authenticator app, there are many other MFA alternatives available. Notice how we didn’t have to add any code to our project? We were able to add in extra functionality to our project by just adding the Rule to our Auth0 account. That makes for easy implementation of many different restrictions or allowances when our users log in. It can also send back additional information from our users that might be useful for our project. Take a look at the extensive list of Auth0 Rules provided. We may find that the code we need is already provided! As well, learn more about other Auth0 features like SSO, Universal Login, 2FA, and more.